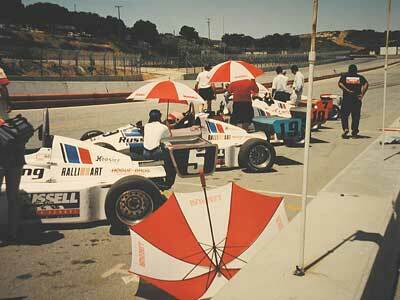 Jim Hall Racing, in Ventura, is a great place to get started if youve never raced before. Jim Hall senior designed and raced the Chaparral in the famous Can-Am series in the 1960s, competing against entries from Lola, Mclaren, Scarab, Mirage, Porsche, Cobra and others at Sebring, Daytona, Lemans, Riverside, and any other place they could run. 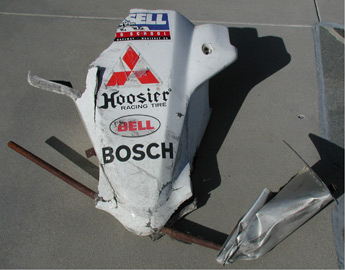 This was pretty much the end of the era when you could build a race car in your garage and go out and win a major series against factory competition. 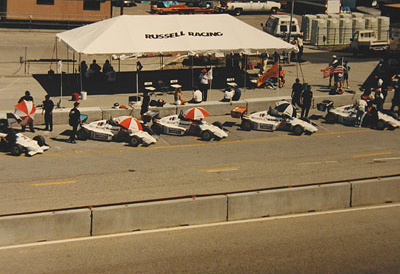 The Chaparral got rebuilt with new additions almost on a weekly basis, with a huge wing for down force attached directly to the rear suspension, and snowblower engines attached to fans sucking the car down to the road, being only two of the innovations Hall came up with. 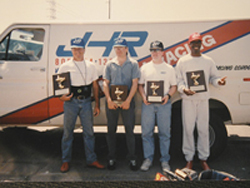 Jim Hall junior is also a racer, and runs go-kart racing schools in several locations, including one just across the Ventura County line north of L.A.
After finishing the school training I ran in the 3-day Grad Runoffs and came in third out of 42 students.The guy on the far left who came in fourth is Archie Hahn, an actor from the Groundlings. 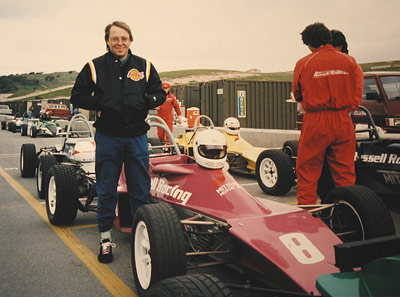 I then did the Jim Hall race series and came in fifth. 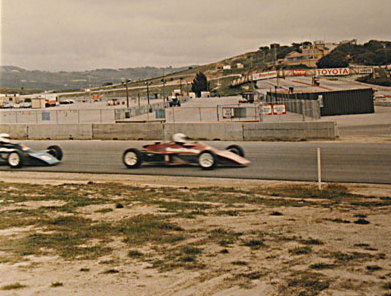 Next was Formula Fords at the Jim Russell school at Laguna Seca Raceway in Monterey, California. 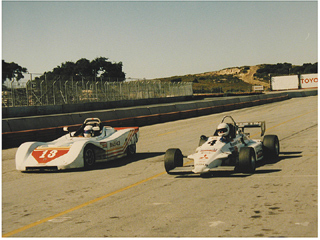 These top out at about 125 mph on the long straight at Laguna, and it rained for a good deal of the three-day class. 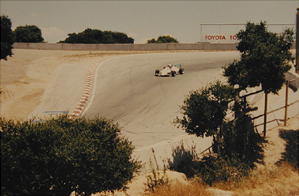 The track is more impressive on the weekends when the IndyCars are running. Moving right along, the Formula Russell school was next. 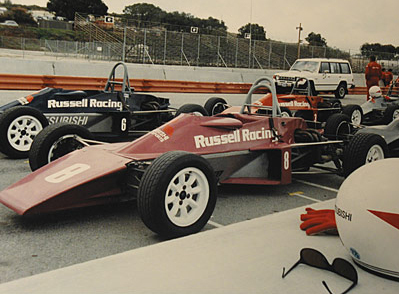 These are Formula (open-wheel) cars with Mitsubishi motors, good for about 150 mph at Laguna.We shared the track from time-to-time with Ford Spec Racers. 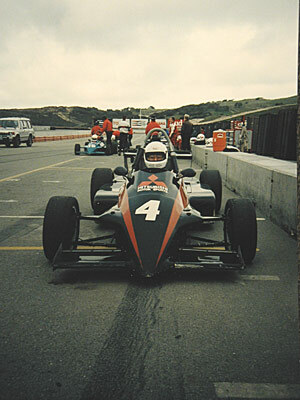 After the three-day class was done, it was time to lap and qualify for the race series. 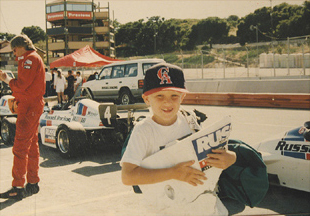 Among the people attempting to qualify were Clint and Casey Mears, the sons of Rick and Roger Mears, who sort of considered Laguna their home track. 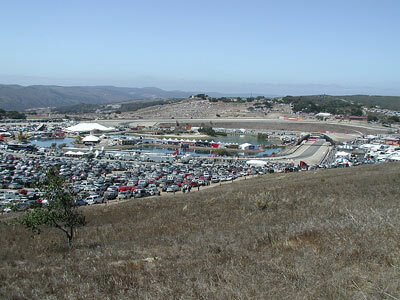 Laguna Seca has the most fun corner in North America, the Corkscrew, a left-then-right twisting downhill nightmare. 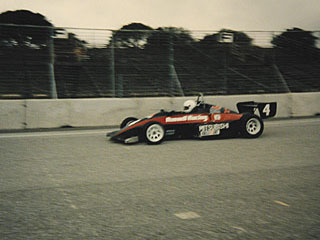 Lapping and qualifying are intense, and the red mist racers talk about can take over if youre not careful. I was lapping well, even though losing a second or two to the Mears on each lap (they have nothing to do all day but practice racing) when I made an error on turn four. Fortunately my family was there to see me hit the wall tail first, then front first. If Id remembered to pull my hands off the steering wheel before impact I wouldnt have been injured at all, but I was still trying to catch the slide, even while on the grass. I ended up with a severely strained middle finger on my right hand, and in a splint it expressed my feelings about the whole situation quite succinctly. Alex got a souvenir and since I paid for the front third of the car, I took it home and it remains in the backyard. 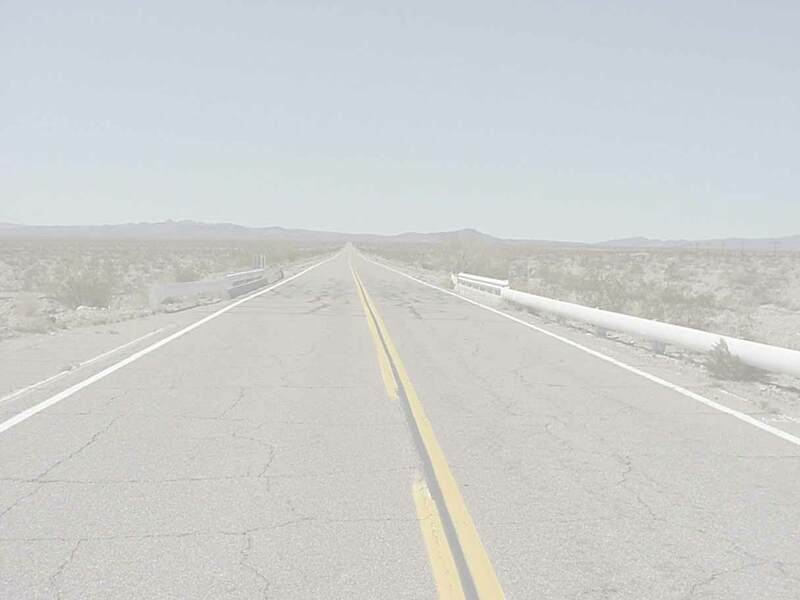 My last adventure was at Willow Springs, when Rusty and I spent the day bashing around in Cobra replicas. They have 5.0 liter Mustang engines and solid rear axles, so theres no way to get all of that power to the asphalt. Basically, youre sliding sideways all day. No fun at all. We were on the small track, because the Lista Ferrari team was testing 333Ps on the big track There was also a cool Hoosier Tire Porsche there testing.